Consistent trend for retail/product searches going back 10 years. Every year more and more “free” SEO goes away and paid SEM takes it’s place. Many domain owners don’t seem to have a lot of real world experience with SEM. 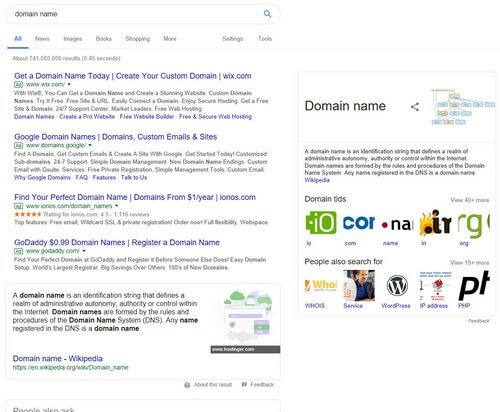 Exact match domains huge advantage, always has been. The higher your CTR the lower CPC you pay vs competition. SEO benefits secondary. Competition is tight, no surprise. Moreover in the domain industry, where your potential customer is anyone and any company out there. Cost per acquisition is so high you must be sure you’re converting your visitors as much as possible and try to upsell other services on top of the domain, otherwise you can’t survive. It’s amazing search result. Google isn’t paying! Google’s whole don’t be evil philosophy went to the birds a decade ago. All money now, 2 cents. Someday people and webmaster’s will catch on. i remember the good old days when we moved to google.com because it was a white page with text only and no ads…….